Fact: cereal is my favorite unhealthy temptation. Do you remember the hullabaloo last month over the news that a surprising number of drunk vegetarians eat meat? Well, if I’m going to indulge after a night of fun… it’ll be cereal. So when I saw Recipes to Nourish’s Cinnamon Roll Oatmeal, I couldn’t wait to give it a happy holidays, grain-free spin. My pumpkin cinnamon roll n’oatmeal is a very pared-down version, and while I had more developed plans for the white drizzle, when it came down it? I decided in favor of simple coconut milk. And it didn’t suffer at all! 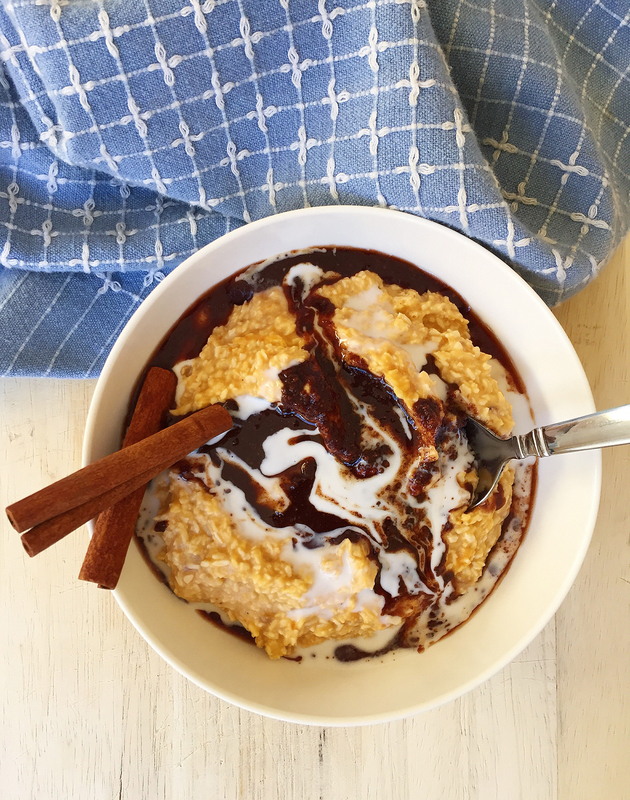 This tastes sweet and festive enough with the banana and pumpkin in the n’oatmeal (plus the coconut sugar in the cinnamon swirl) without doing anything complicated. Let me tell you: I didn’t intend to eat a bite of this after photographing it, and then I looked down at it and ate half a bowl. It’s that fun and tasty! Perfect for a holiday morning (or as a late-night snack that won’t completely undermine your wellness goals). Play around with using butternut squash or even sweet potato puree if pumpkin isn’t readily available. Just load everything into a food processor, stir together the topping, drizzle and then enjoy! Festive and decadent, this Pumpkin Cinnamon Roll N'Oatmeal is the perfect breakfast to make a weekday morning special or on the weekend to share. Puree the n'oats ingredients in a food processor or blender until combined but a bit of the texture of the shredded coconut remains. Spoon into serving bowls. Stir together the toppings ingredients except the coconut milk. Drizzle over the n'oats. Pour the coconut milk over the cinnamon mixture and n'oats. 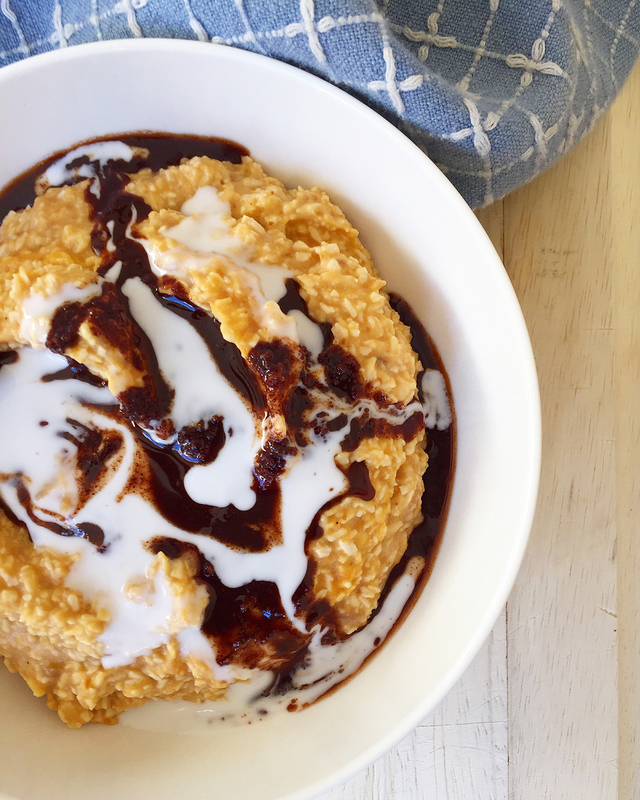 Adapted from Recipes to Nourish's Cinnamon Roll Oatmeal. Oh my goodness this looks so good! And beautiful too … your photos are always so pretty! Thanks for linking to the oatmeal, honored that it inspired you. xo Pinning. Thank you for the compliment and the inspiration! Yummmmm that sounds so delicious! What a great idea! I made a big batch of pumpkin puree and am looking for creative ways to use it. This looks like one of them! Mercy this looks good! I love using coconut to add creaminess. This looks great! It’s really similar to oatmeal in texture, I was surprised. This looks super tasty! Thanks for the recipe! This looks amazing! That topping!!! So much fun to swirl and drizzle! Oh yummy! This looks so delish! Can’t wait to have for breakfast! Looks amazingly delicious. Yummm ….. This absolutely sounds and looks amazing! 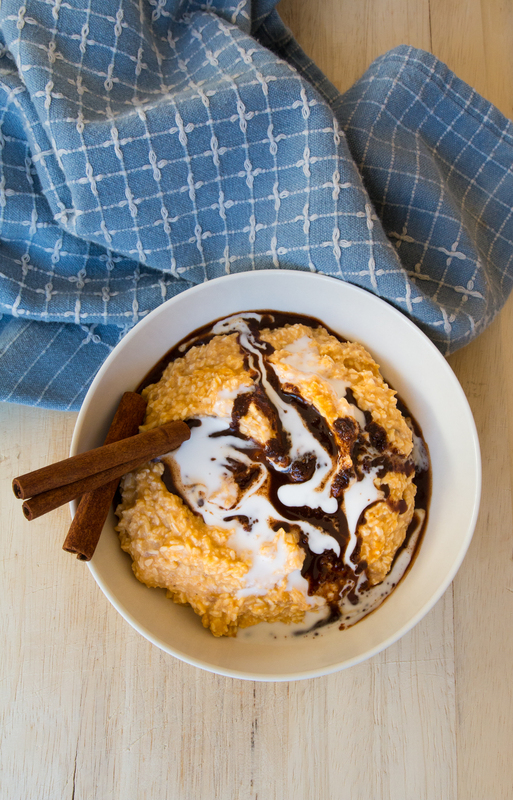 I love pumpkin everything and this is right up my alley for breakfast! Meeee too! So happy every year when pumpkin season comes around. Love the color! Beautiful recipe as always! I know, isn’t pumpkin fun? The base recipe is delish on its own… extra fire-works from the cinnamon swirl and coconut milk! Sounds like a fun take on oatmeal, which I used to love! Yum! This sounds like a delicious combination! Yumming this to try later. YES we are cereal-obsessed partners in crime. Cereal is my ultimate comfort food. I rarely keep it in the house anymore because I have no willpower. I’m making this tomorrow morning – shockingly I have all the ingredients for it, plus it looks AMAZING and nutritious! WOW! I always love your recipes and this one just looks so inviting and delicious. And hey – bonus it’s totally AIP compliant! Sharing!!! This looks so warm, comforting and delicious. I love how the oats are bulked up with delicious banana, pumpkin or sweet potato! YUM! Am I missing something? Is this supposed to be eaten hot or cold? Room temperature is how it comes out when made according to the recipe. You could heat it gently over low heat or refrigerate it no problem, though. It’s quite versatile. What constitutes the protein in this? Wow, sounds amazing with the blueberries! I don’t understand? Where is the oatmeal in this recipe? Am I missing something? “N’Oatmeal” is short for not oatmeal. if using butternut squash, does it need to be cooked first or do you puree it raw? “N’Oats” is listed as an ingredient. What is it? What store can I find it? I am curious… about how many n’oats would make sense with this recipe? I was thinking of pairing it with spaghetti squash… THANK YOU! There’s no such thing as n’oats. 🙂 It’s called n’oatmeal because there are no oats in it.